Kat Ferreira An Oakland resident for over 20 years, Kat Ferreira's local Fruitvale area roots skip back a few generations to the early 1900s. Active in the community, she has volunteered with a variety of Oakland-based nonprofit organizations and neighborhood groups, including the Eastlake Music Festival, Friends of the Oakland Fox theater, Wardrobe for Opportunity, and more. Her professional background spans the public, private, and nonprofit sectors, with an emphasis on community advocacy, nonprofit fundraising, social policy research, online marketing and social media. You can follow Kat on Twitter and Instagram. Monica Green Monica Scott Green is the Family and School Partnership Lead at Bay Area Parent Leadership p Action Network (PLAN) where she assists school communities to develop systems to engage families as equal partners in their children’s education. She believes that families, schools and communities share equal responsibility for children’s education. She appreciates learning about the rich cultural history and diversity families bring to Oakland schools and has studied throughout the Pacific Rim. Monica Green has a doctorate in organizational leadership from University of San Francisco School of Education. Monica enjoys rowing on Lake Merritt and dancing with her husband of 25 years, Gerald Green. Their son Charles lives in the Denver area. Sandra Tavel Sandra Tavel lives and works in East Oakland. Emigrating from La Paz, Bolivia and growing up in suburban Denver shaped her desire to put roots down in a place that is diverse, politically progressive and rich in social justice oriented history. This journey brought her to Oakland, which gets a disturbing and bizarre rap on much of the media that exists today. 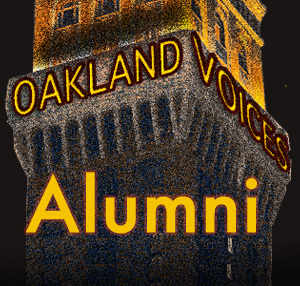 She’s looking to move the needle to create different narratives that reflect the complexity and nuances that make Oakland what it is. She has been an avid writer and voracious reader her whole life. When she’s not working, reading or writing, you can find her at yoga class, hiking the Redwood Regional Park System or playing on the beach with her partner and two dogs. Tony Daquipa Tony Daquipa is a musician who has been studying and playing a variety of percussion instruments since 1986. In the 1990s, he was also a journalist, historian, and community activist. After that, he worked in non-profit public health for 13 years, during which time he also returned to school to study public policy. He is in his third year of working in the public sector. In addition to public service and music, Tony is a proud parent, public school advocate, published poet, photographer, hop farmer, collector of East Oakland rainwater, urban bicyclist, karaoke diva, grumpy old man, storyteller, and preserver of history.